A headline like "12 Reasons To Buy A Nissan Altima" on your high school classmate's Facebook wall isn't too far off in the future if car companies have their way. 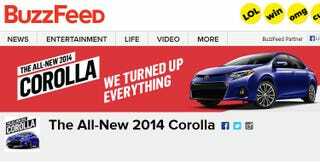 Vince Bond at Automotive News reports that some automakers have been sneaking in some sponsored content — and hey, we have it here, too — over on BuzzFeed as a way to target BuzzFeed's largest audience: Nostalgic millennials who suddenly realize it's not 1999 anymore. Toyota, Ford and Volkswagen, all of whom aren't shy about selling the most cars as possible, are among BuzzFeed's biggest automotive clients right now. VW posted a very BuzzFeed-y list earlier this year "9 Songs That Will Turn Your Frown The Other Way Around," and while they didn't scream "BUY A PASSAT" at the end of the list, it did play on their "Get Happy" slogan. "With the 2014 Corolla, we know that we have a new kind of consumer — they're hyper social digital natives connected to everything they care about from friends, to entertainment, to researching for their first new car," wrote Dionne Colvin-Lovely, Toyota's national marketing media manager, in an e-mail Q&A. "Connecting with them meant meeting them where they already were." "Hyper social digital natives?" I'd like to use an iPad to send of selfie of me vomiting to everyone in Toyota's marketing department, or specifically the person who came up with that phrase. But this is one of those things where we have to accept that car companies have to find some kind of way to attract that on-the-fence buyer who's less than enthusiastic about cars but still needs to drive. They provide the profits that subsidize the fun cars we love. And that's not a bad thing. So good on the automakers for finding another marketing channel, and a hat-tip to BuzzFeed for being a willing partner. It'll be interesting if buyers ever admit to dealership surveys that they walked into a showroom because of a collection of carefully curated .GIFs, but we'll see if that ever happens.